I love having a clean kitchen. More so than any other room. If my kitchen is clean and sparkling, I can sit back in my messy living room amid a pile of clean clothes and an even larger pile of dirty clothes leering at me from the bedroom, and somehow I am content. I don't get it either, that is just how it is. And that is just what I did yesterday. I deep cleaned all of the dirt out of that sucker. It now sparkles and smells good and although I have many more messes to work on, I am happy and content in the cleanliness of my kitchen. Strange? You bet I am. Yesterday I was happy. I didn't sleep much due to the rumbling sky, but it didn't matter because I love the thunder. It made me happy although it woke me up at 5:00 am. I didn't mind the heat so much either since there was a beautiful sporadic breeze that would tease me all day long. I left the windows open and although it was hot and Keith got to go around the house naked (I really wanted to do that as well, but didn't think the neighbors would look on it too keenly.) that breeze never disappointed. Right when I was about to close the windows, it would dance in triumphantly pulling at the curtains, my hair, my skirt... enough so I never really did get around to closing them. I love the wind, but sometimes it plays some fun pranks on people. I was at the gas pump filling up our poor pathetic car today. The wind was having a hay day playing with peoples' belongings and thoroughly enjoying itself as it annoyed everyone and everything it came into contact with. Evidently it decided to make me it's next victim. 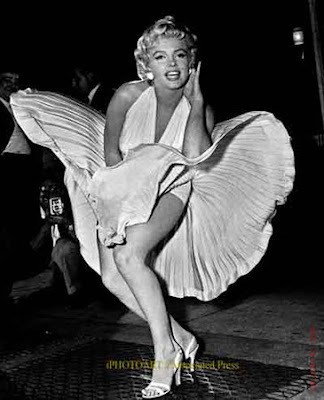 I was minding my own business watching the gas prices climb steadily higher when suddenly I had a Marylin Monroe moment. Only she was able to catch hers before showing the world her bloomers. I wasn't so lucky. Half my town got to see what I wear beneath my skirt. Once I realized that it was flying up near my head, I quickly tucked the fabric between my legs, finished pumping the gasoline, jumped into my car and had a good long laugh. Really, what would you have done? I couldn't get mad because it was the wind. How silly would I have looked had I tried telling it off? I probably would have had a skirt up around my neck again. I couldn't do anything about it, and I know if it had been someone else I would have laughed, so that is what I did. I laughed at myself. But really, I do enjoy the wind. After dinner last night I went outside, stood under the trees and danced around like a mad woman. Keith stood on the porch and watched me at first, but eventually came down and joined me dancing and singing to the sky. What bliss! Dancing under the trees and playing with the wind. I love the way the leaves dance in the wind, and I wish i could replicate it. Did you know some of my leaves are turning already? I was shocked to look out my window Wednesday and see the leafy green foliage with a touch of rust and gold coloring around the edges of a few. I told my mother about it and she thought my trees might be dying. What a sad story! But they are not! My neighbor's trees also have a touch of Autumn on them. I think it is a way to tantalize me. I love the colors of fall more than nearly anything else in the world. I am so excited for the holidays of fall. How sad is this; while sitting amidst my messy clothes piles and admiring my pristine kitchen yesterday I began looking for decoration ideas for Halloween. I know, I am pathetic, but it is something I love and look forward to for about 10 months of the year. I am content once it has passed, and then get excited for Thanksgiving and Christmas, but once the holiday excitement has passed, I begin to long for Fall again. And with this weather... if I did close my windows and crank up the AC I could certainly fool myself into thinking we were entering the oh so beautiful and spooky month of October! Hot chocolate here I come... just not today. I have nearly melted today. How funny. I wish my tree still was green, but we are only allowed to water once a week. So everything is pretty much dying or dead. It is sad. We need some rain down here, could you send us some? it makes sense to me, you're on the hunt for fall and fall decorations. i get it. Stopping over from SITS! Happy Saturday Sharefest! Love your blog! I'll be back! Loved this post. What beautiful trees you have! I love the hint of autumn in them too :). You definitely have a way with words btw! Happy Saturday Sharefest! I really LOVE your blog! I'm now a follower! You lucky girl! You get two SITS Sharefest posts today :) since you forgot your link, your comment was technically in front of mine ;) I'm sending some love to the "real" person in front of me too.. don't worry lol! Happy SITS Day! Beautiful blog.